Common Sense was an immediate success. Newspapers in other colonies reprinted all or part of it. It was translated into German and reprinted in England, Scotland, Holland, and France. Its American sale of 120,000 copies in three months gave it a circulation equivalent to over six million today. 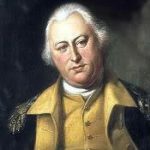 In the bleak days following Washington’s forced retreat across New Jersey and the Delaware River, Paine’s writing revived the flagging morale of the troops and the civilian population. On December 19, 1776, while serving in the Continental Army, Paine published the first of a series of propaganda pieces, entitled The American Crisis. The inspiration generated by that pamphlet is credited with contributing to the American success at the Battle of Trenton. The Crisis series of sixteen highly influential articles were published between 1776 and 1783. In these essays published in the Pennsylvania Journal, Paine attacked the faint-hearted, campaigned for a more efficient federal and state tax system to meet the costs of war, and encouraged the belief that Britain would eventually recognize American independence. Paine made little money from his journalistic successes. In April 1777, largely because of his writings, Paine was elected Secretary of the Committee of Foreign Affairs in Congress. However, he was forced to resign two years later when it was discovered that he had released in a newspaper article containing privileged information about treaty negotiations with France. In the following nine years, he worked as a clerk at the Pennsylvania Assembly and published several of his writings. pen and his book Rights of Man. When Washington appealed for supplies, Paine organized a solicitation, contributed $500 from his own meager salary, and helped organize the Bank of North America to finance the supplies. Paine was always hard-pressed for money and had to depend upon the generosity of his American friends and the occasional reward from the French envoy in America. After the war, his financial position was so precarious that he had to campaign for money from the government. Congress eventually rewarded him $3000. 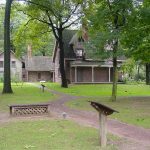 Pennsylvania granted him £500 in cash, while New York proved more generous and gave him a confiscated Loyalist farm at New Rochelle, New York. After the Revolution, restless because he was no longer at the center of affairs, Paine conducted various scientific experiments and invented a method of constructing an iron bridge. In an attempt to promote the bridge, he returned to Europe in 1787. 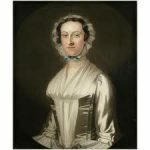 For the next four years, he divided his time between Britain and France, and eventually resumed work as a revolutionary propagandist in the 1790s. Paine became deeply involved in the French Revolution, and was inspired to write his most influential work, The Rights of Man (Part I in 1791, Part II in 1792). In Part I, he urged political rights for all men because of their natural equality in the sight of God. All forms of hereditary government, including the British constitution, were condemned because they were based on farce or force. Only a democratic republic could be trusted to protect the equal political rights of all men. Part II was even more radical – Paine argued for a whole program of social legislation to deal with the shocking condition of the poor. The Rights of Man was banned in England because it opposed the monarchy, and Paine was labeled an outlaw. He would have been arrested, but he fled for France. He immersed himself in French affairs for the next ten years, although he still hoped to see a revolution in Britain. In his Letter Addressed to the Addressers of the Late Proclamation, he rejected the policy of appealing to parliament for reform and instead urged British radicals to call a national convention to establish a republican form of government. In August 1792, Paine was made a French citizen, and a month later was elected to the National Convention. Since he did not speak French, he had to have his speeches read for him. In January 1793, Paine irritated French radicals when he voted against the execution of the dethroned king, Louis XVI. From December 28, 1793, until November 4, 1794, he was incarcerated in Luxembourg prison until the new American minister, James Monroe, worked to get him released. Paine publicly expressed bitterness at Washington’s failure to intervene on his behalf in a Letter to George Washington (1796). During his imprisonment, he wrote and distributed the first part of what was to become his most famous work at the time, The Age of Reason, a statement of his religious beliefs. It opens with the words: “I believe in one God and no more, and I hope for happiness beyond this life.” There was nothing really that new in Paine’s argument, but the bitterness of his attack on the Christian churches made him many enemies. For generations, The Age of Reason was misunderstood, and Paine was accused of being an atheist, when in fact, it is an expression of deist principles, accepted by Benjamin Franklin, Thomas Jefferson, and other 18th century intellectuals. The Deist Principles are similar to the Ten Commandments, except they are not claimed to come from God. Deism is a belief that a supreme being created the universe, and that this (and religious truth in general) can be determined using reason and observation of the natural world alone, without the need for either faith or organized religion. As a Deist, Paine believed that the true word of God is nature. Paine remained in France until 1802 when he returned to America after an invitation from Thomas Jefferson, who had met Paine when he was minister in Paris. But Paine discovered that his contributions to the American Revolution had been all but eradicated due to his radical religious views. He was attacked for his criticism of George Washington and his denunciation of traditional Christianity. Paine was ostracized by former friends such as Samuel Adams and Benjamin Rush, harassed by children in New Rochelle, deprived of the right to vote by that city, and even refused accommodations in taverns. Even his wish to be buried in a Quaker cemetery was denied. Paine devoted his major efforts to writing newspaper articles which defended the administration of President Jefferson and the political principles espoused in 1776. During this period, Paine advised James Monroe in his negotiations for the purchase of Louisiana, and suggested to President Jefferson that the United States should serve as mediator between France and the black republic of Haiti. Increasingly neglected and ignored, Paine’s last years were marked by poverty, poor health and alcoholism. Derided by the public and abandoned by his friends, he was virtually an outcast. 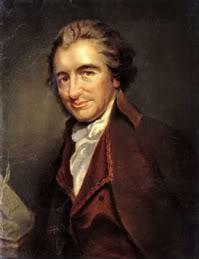 Thomas Paine died in poverty on June 8, 1809, at the age of 72 in New York City. He was laid to rest in a corner of his small farm in New Rochelle. Ten years later, the English radical William Cobbett disinterred Paine’s casket with the intention of reburying it in England as a symbol of democratic reform. 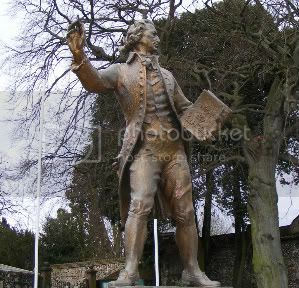 Great Britain refused permission and somehow Paine’s remains disappeared. Paine communicated the ideas of the Revolution to common farmers as easily as to intellectuals, creating prose that stirred the hearts of the fledgling United States. He had a grand vision for society: he was staunchly anti-slavery, and he was one of the first to advocate a world peace organization and social security for the poor and elderly. But his radical views on religion would destroy his success, and by the end of his life, only a handful of people attended his funeral. Posterity did better by Paine. New Rochelle erected a monument on the original gravesite; England hung his picture in the National Portrait Gallery and marked his birthplace with a plaque; France erected a statue in Paris; and Americans placed his bust in the Hall of Fame at New York University. The Monument to Thomas Paine in New Rochelle, New York, is a bronze bust of Paine that was modeled by sculptor Wilson MacDonald of New York City. It was presented to the Thomas Paine Historical Association, and was placed on the capstone of the monument early in 1899, and dedicated May 30 of that year in the presence of a large audience. These are the times that try men’s souls: The summer soldier and the sunshine patriot will, in this crisis, shrink from the service of his country; but he that stands it Now, deserves the love and thanks of man and woman. Tyranny, like hell, is not easily conquered; yet we have this consolation with us, that the harder the conflict the more glorius the triumph.